This is a dish that I’ve eaten all my life. My mother always cooked it without meat and that’s how I got used to it. I never liked eating vegetables, legumes or beans with meat. I was always inclined to a more plant based diet, though I’ve never officially declared myself a vegetarian. 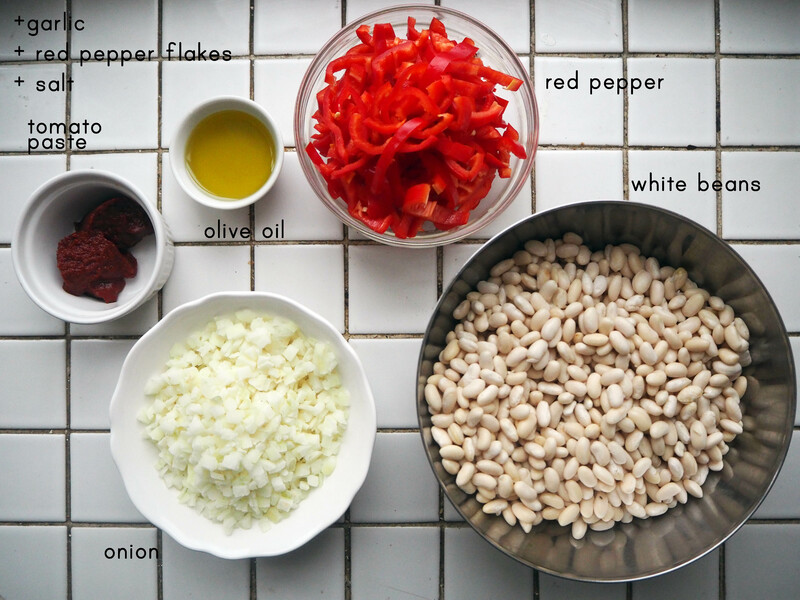 The idea is: you cook the beans and pilaf separately and then while serving, first put some pilaf on your plate and then the beans on top. Some like it next to the pilaf, while I like it on top. You might think that it is not a huge difference, whether they are next to each other or on top, but it does make a difference!! As I said at the beginning, this is a very easy dish to make. However, you need to start making it the night before. 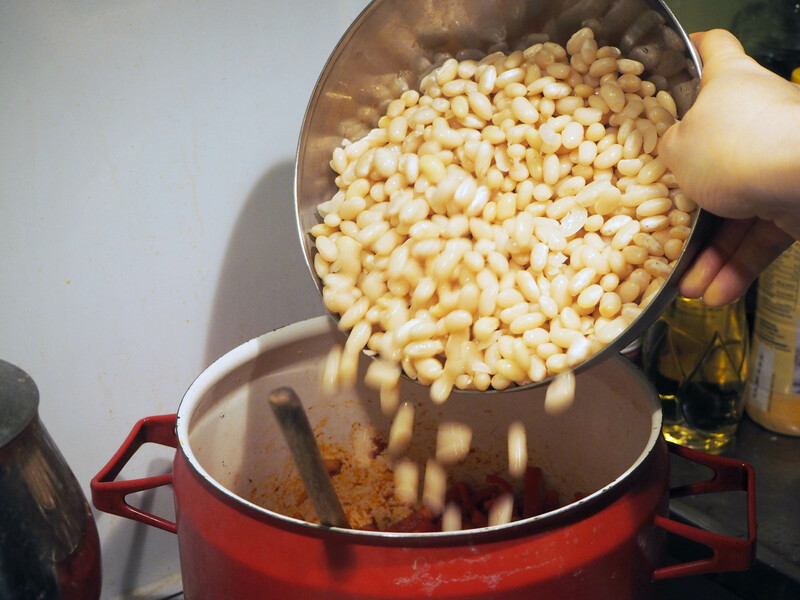 I mean, you need to soak the beans. 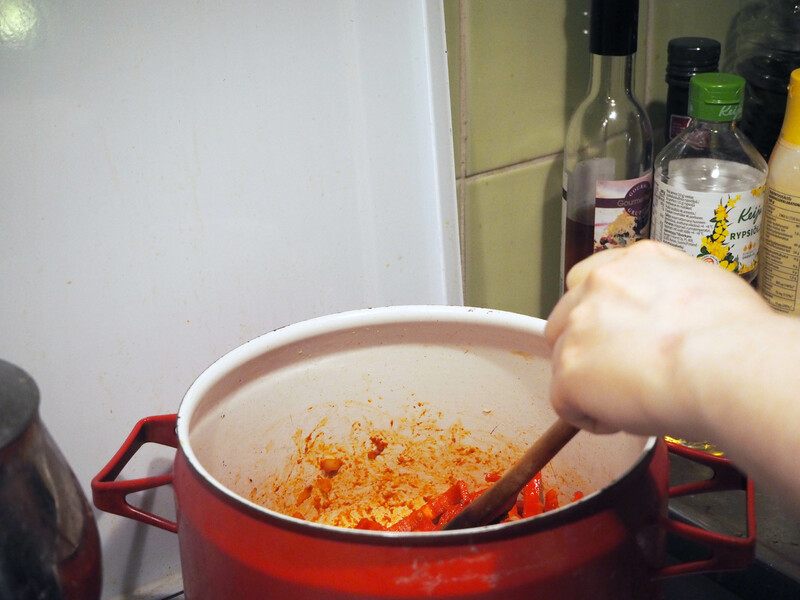 But that’s all you need to do beforehand and the actual cooking part is not that hard the next day. 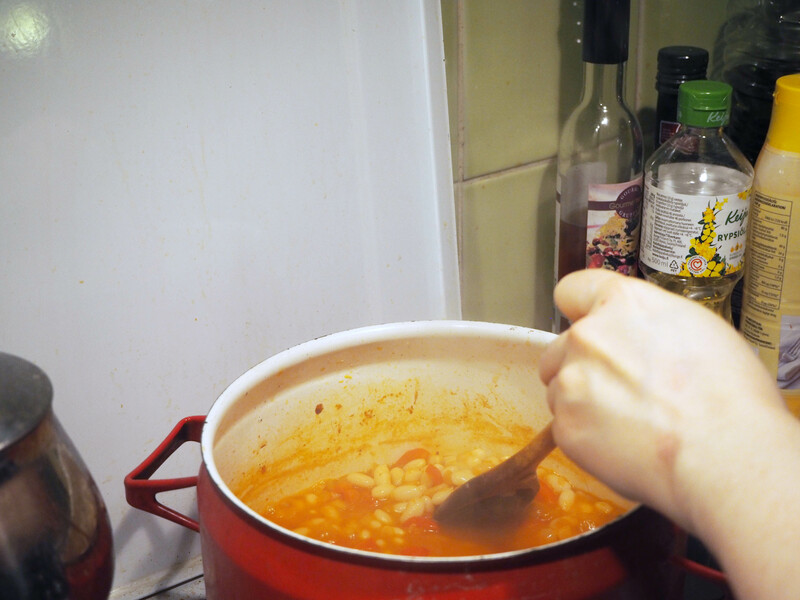 I soaked the beans for 10 hours in cold water and it helped a lot with cooking the next day. Apparently, this was also the favourite dish of Ataturk, the founder of Turkish Republic. It was something that he got used to eating while he was a student and it stuck with him for the rest of his life. He wanted to eat it all the time, at least several days a week. I find it fascinating that a man who was the most beloved leader of his people and who could eat almost anything he wished was just a humble white bean lover. Last Saturday was the 80th anniversary of his passing. I wish he lived much much longer than he did and kept the country on a better track without dying so soon… Hope you enjoy this humble but delicious dish as much as Ataturk and I do! 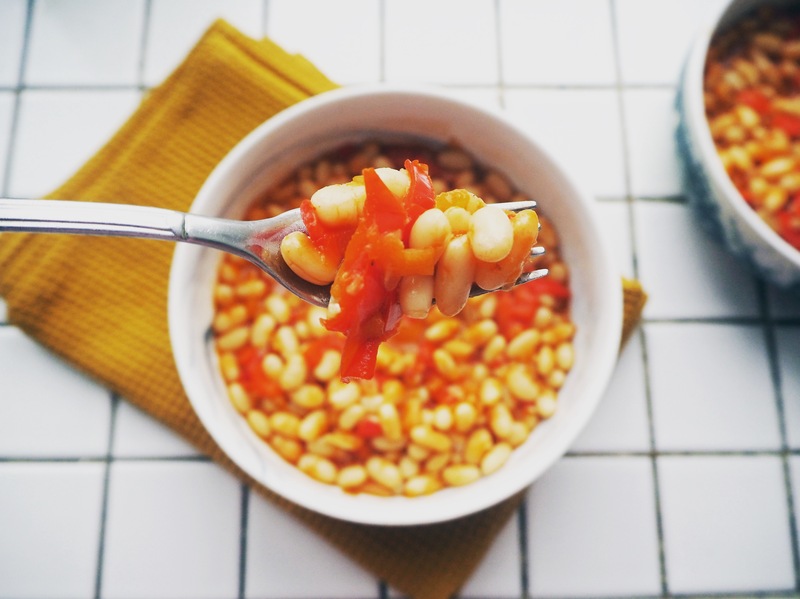 *These are quite small beans and you can find them in Alanya or Kimene Oriental market in Itäkeskus, in Helsinki. 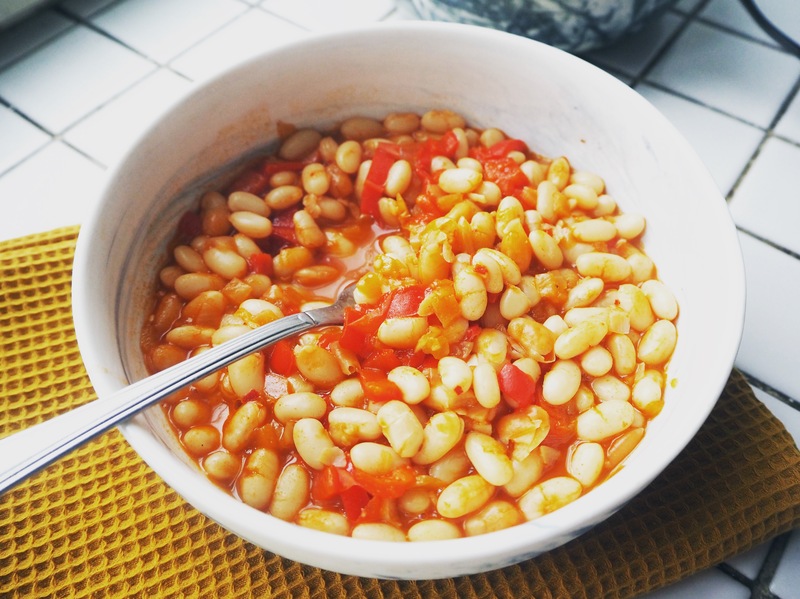 If you can’t find these small white beans, you can substitute with bigger butter beans, though the cooking time will change in this case, and essentially the dish itself as well (but it will still be delicious to eat). **In the most traditional way, people cook this with green banana peppers. But I like it with red pepper. So if you like green peppers more, feel free to use those. 1. 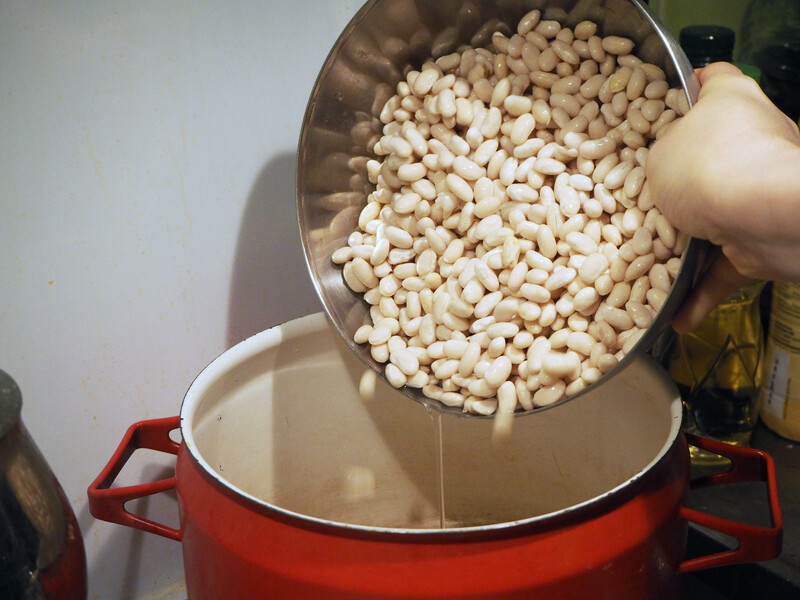 Drain the soaked beans and put them in a heavy bottom pot. 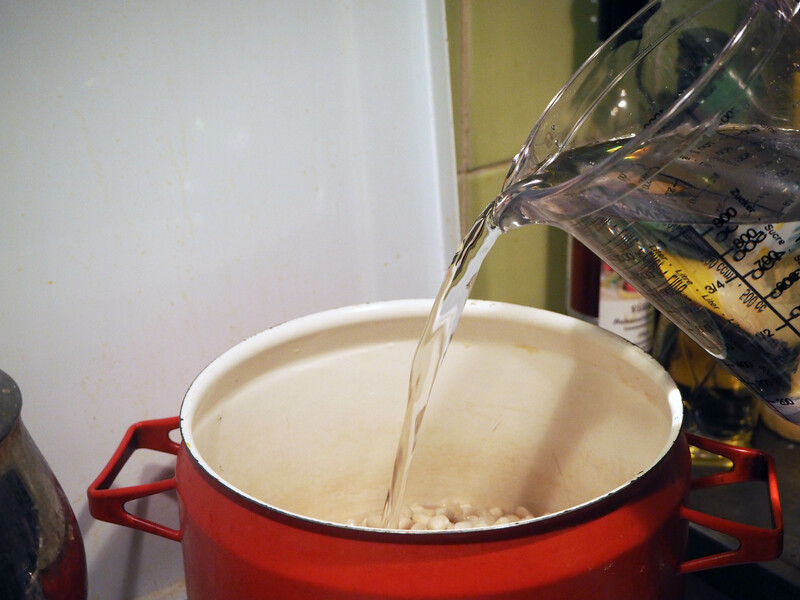 Pour cold water completely covering the beans and even exceeding about 2 cm. 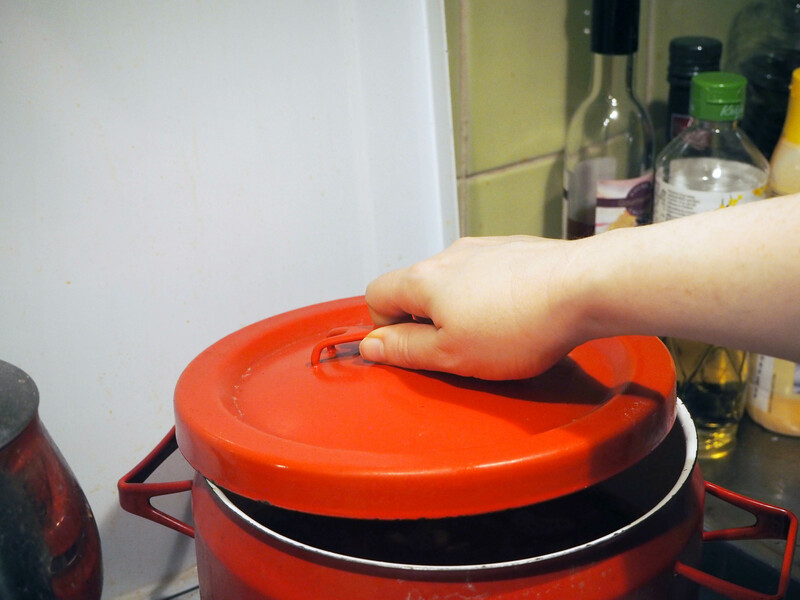 Turn on the heat to medium high and cover the lid. Let the beans boil. 2. 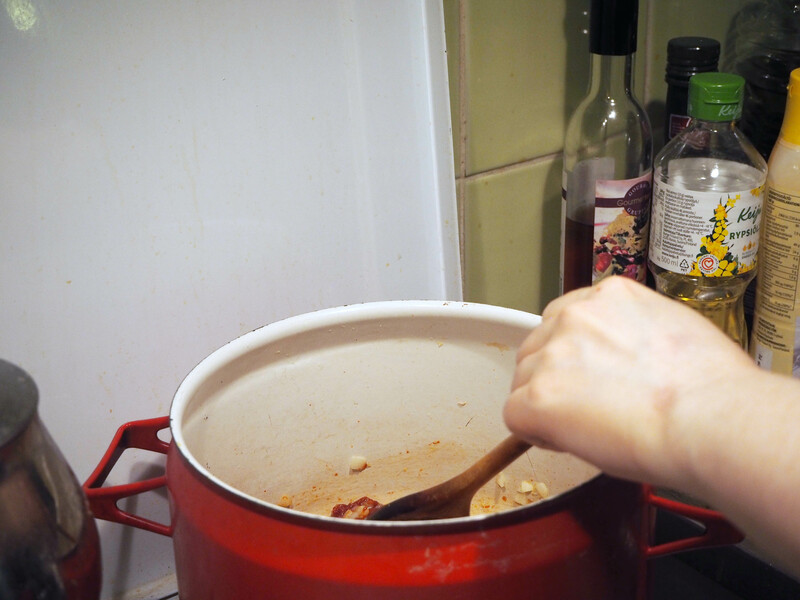 When the water is boiling for 5 minutes (keep an eye on the pot, boiling water might overflow), move the lid of the pot to keep it slightly open, lower the heat to medium and continue cooking for 20 minutes. 3. 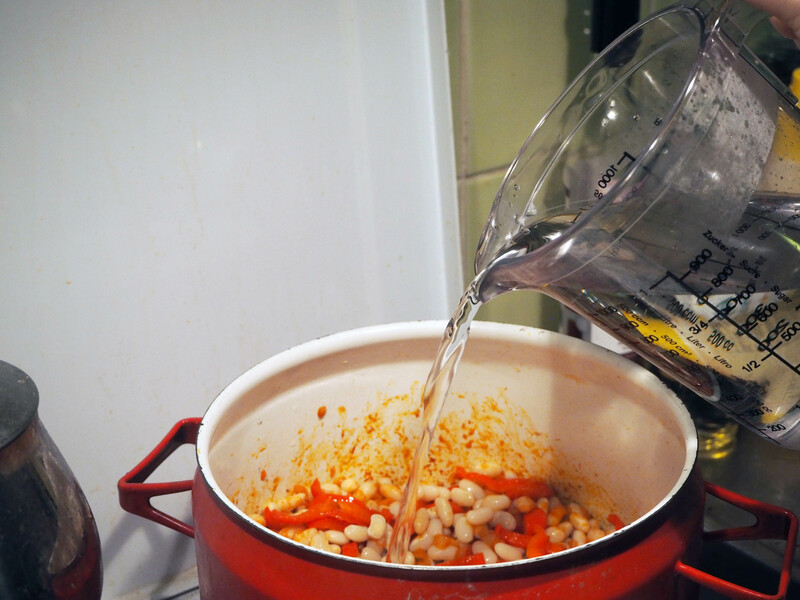 When the beans cook for 20 minutes, turn off the heat and transfer the beans onto a strainer to get rid of the water. 4. 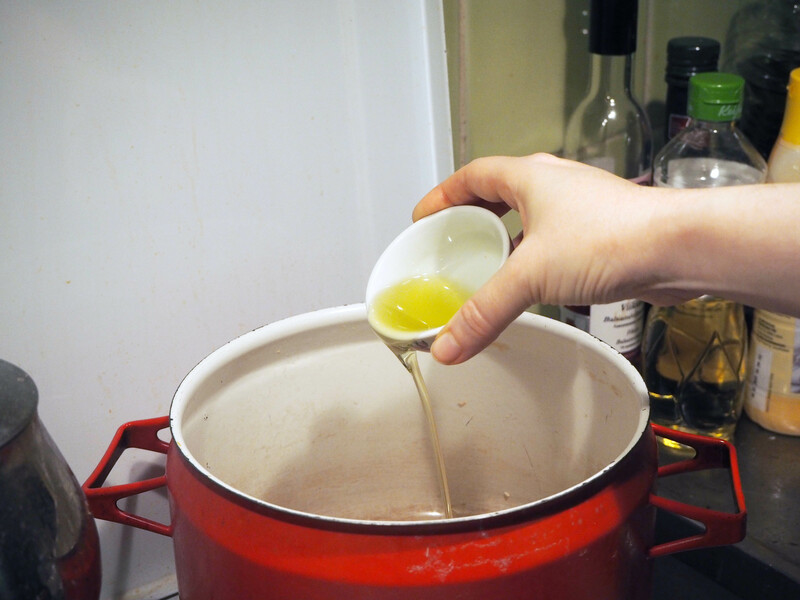 Using the same pot, put olive oil and turn on the heat to medium high. 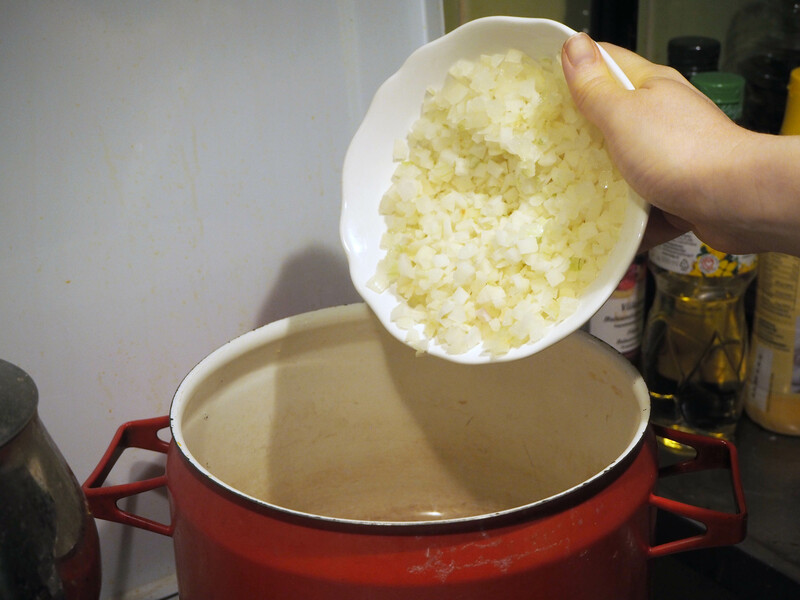 Warm the oil for half a minute and then add onions. Saute the onions until they are translucent. 5. 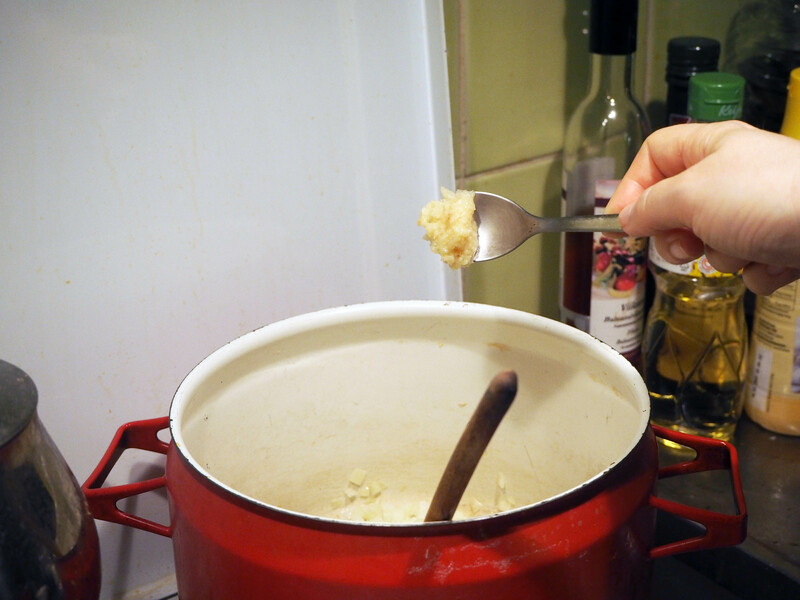 Add mashed garlic and continue cooking for couple more minutes, stirring often. 6. 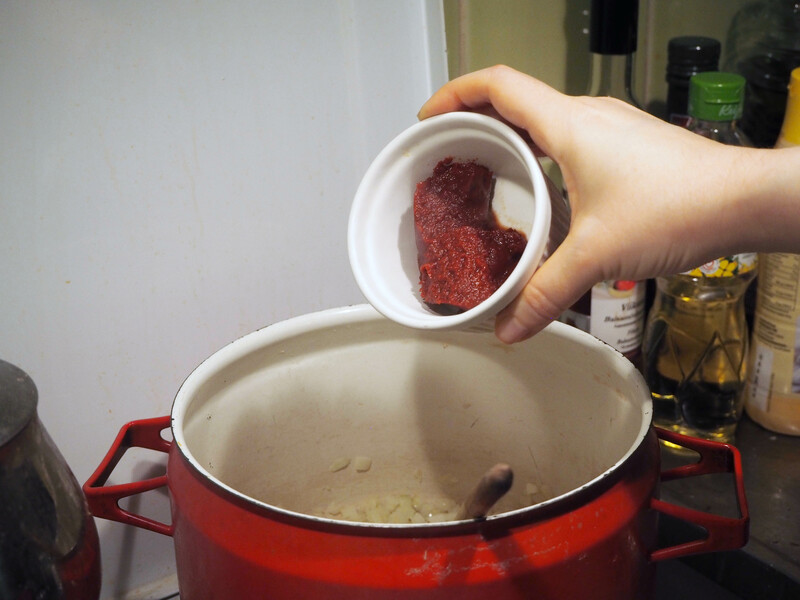 Add tomato paste and continue cooking for one more minute while stirring. 7. 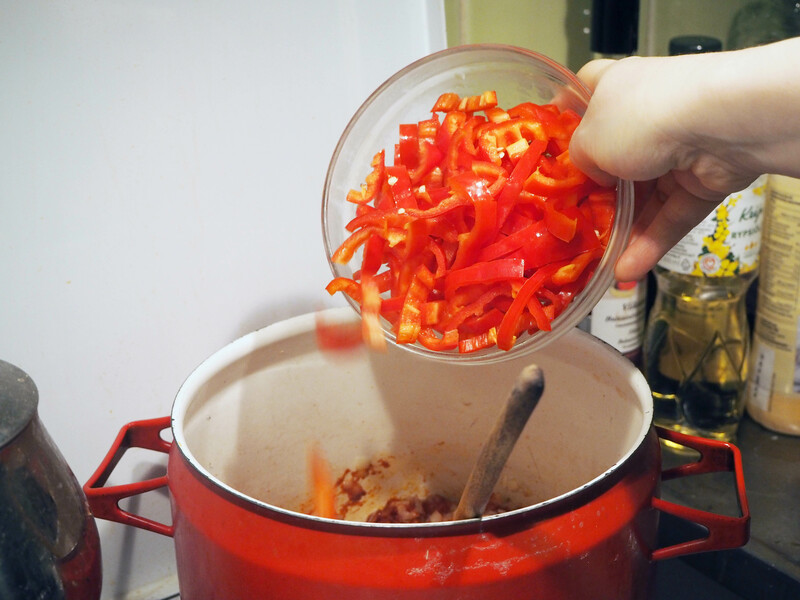 Add red pepper and again, continue cooking for one more minute while stirring. 8. 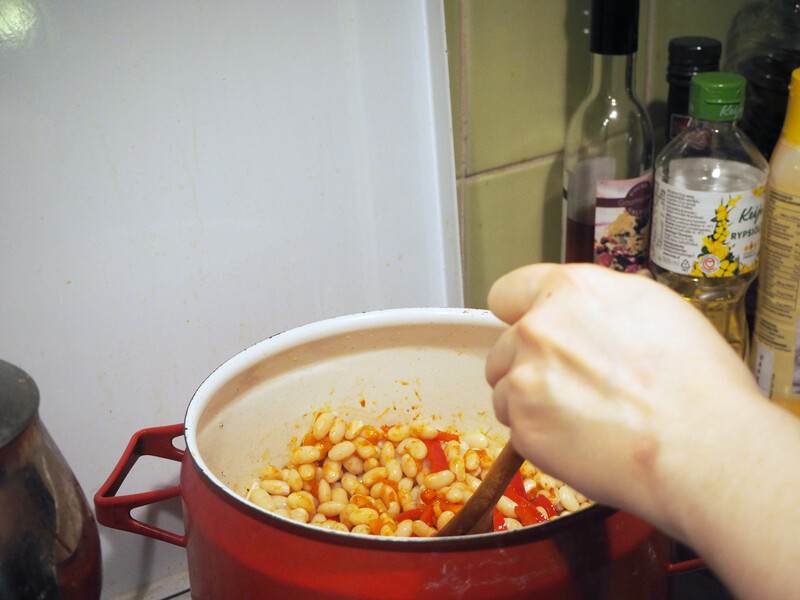 Add the beans and stir a little so that the beans mix with previous ingredients. 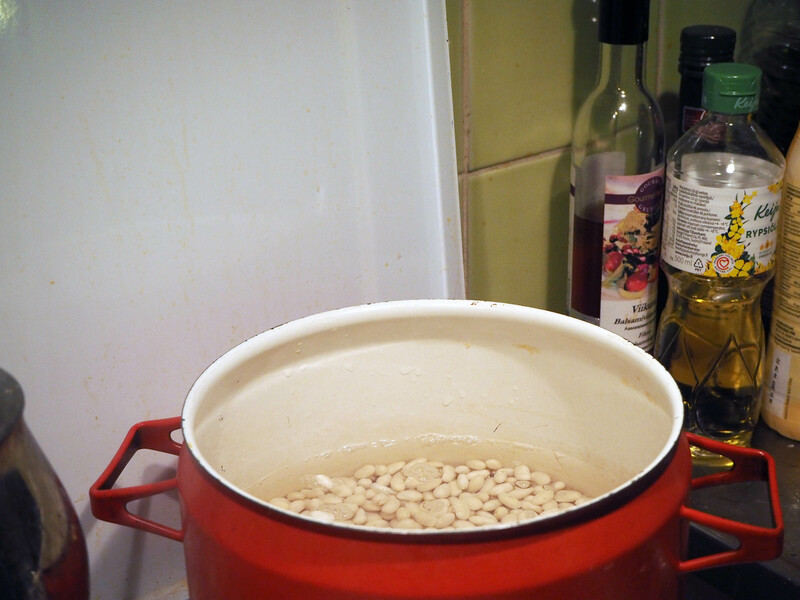 Add very hot water to cover the beans and even exceeding just little more. 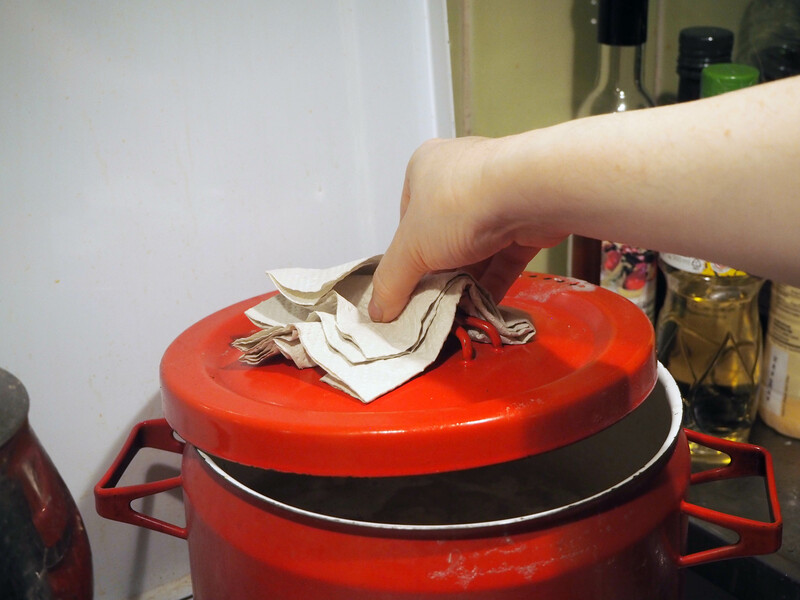 Put the lid but don’t cover fully. 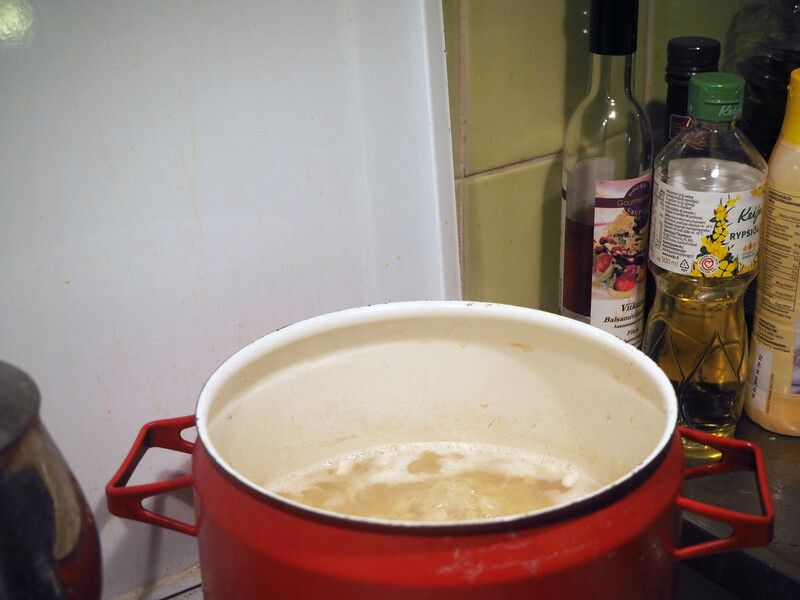 Let the beans boil. 9. 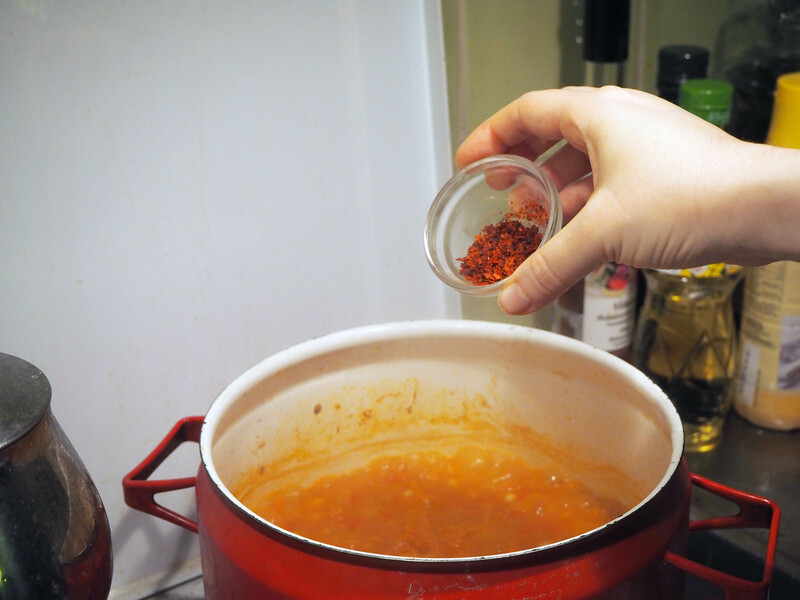 When the beans starts to boil, take away the cover, put salt and red pepper flakes, lower the heat to medium and continue cooking while stirring every now and then for 25 minutes or until the beans are soft (but not mushy so keep checking often). 10. 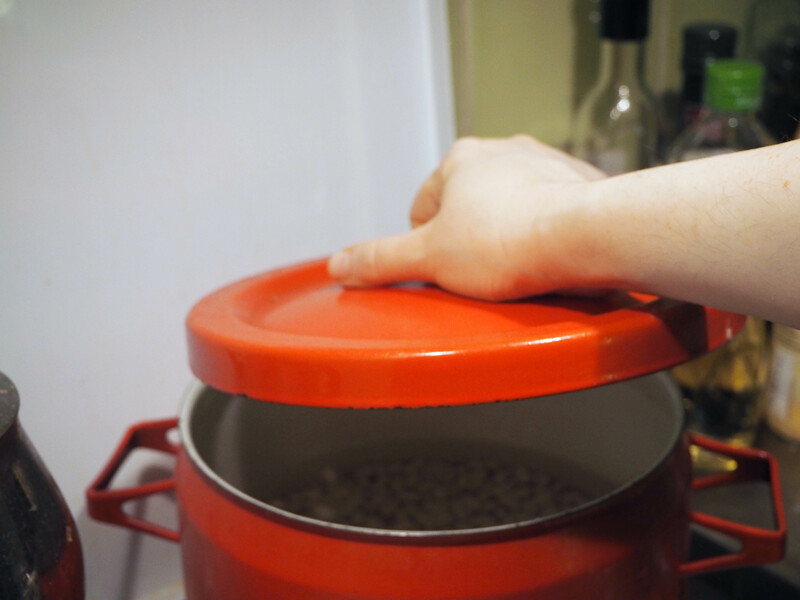 When you believe that the beans are ready, check for the seasoning and adjust if needed. 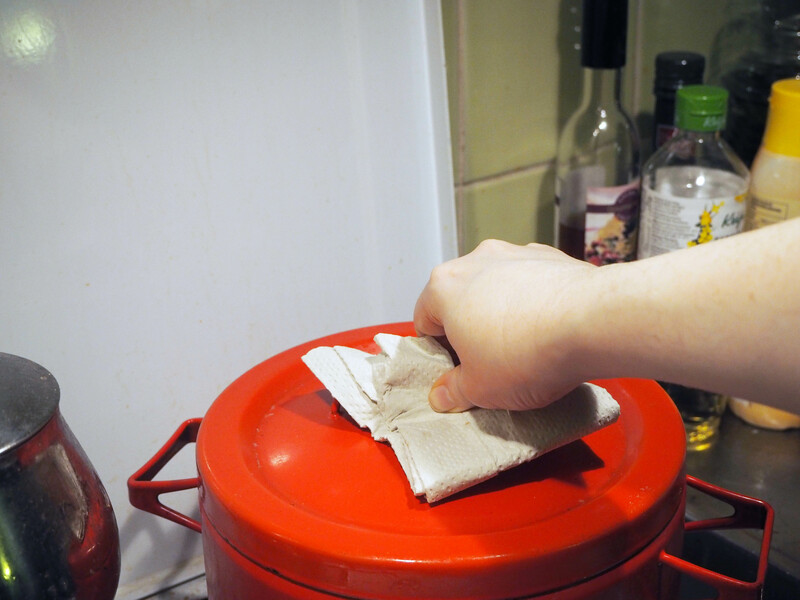 Turn off the heat, cover the lid of the pot and let it rest for at least 10 minutes. 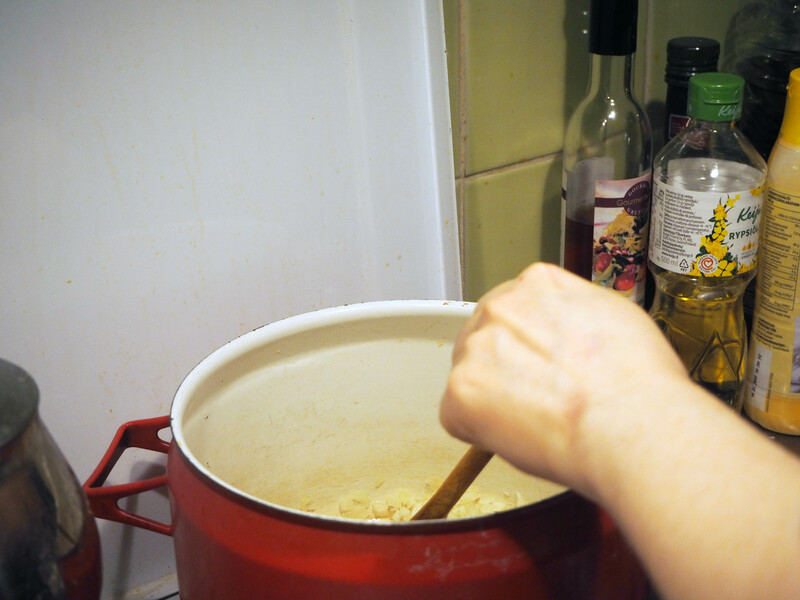 Serve on top of rice pilaf or just by itself. Enjoy! I like a similar dish! 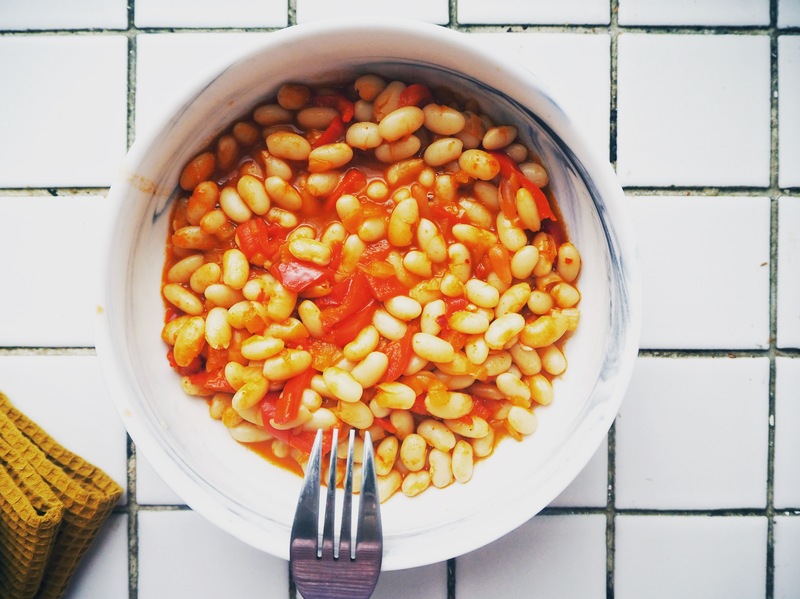 Try using butter beans. They are bigger. 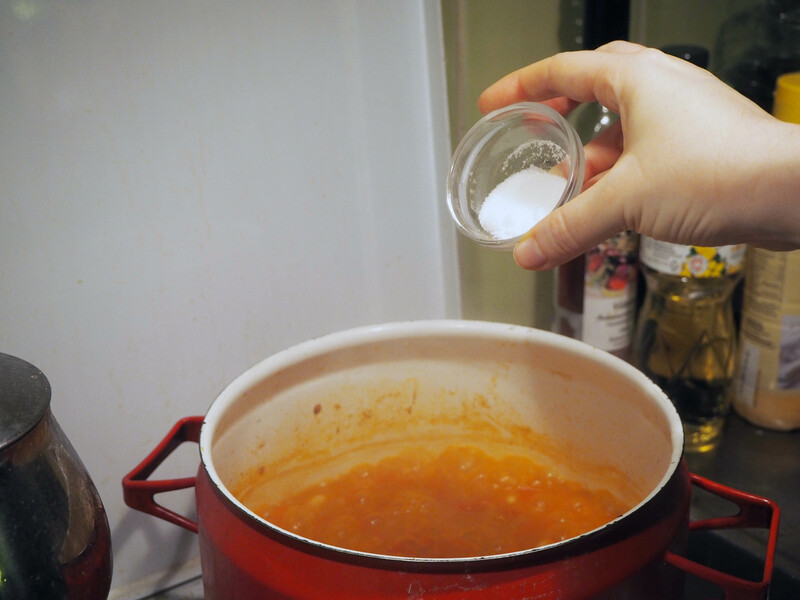 I love thus recipe, I’m making it on Friday – with your easy to follow instructions. Thanks! 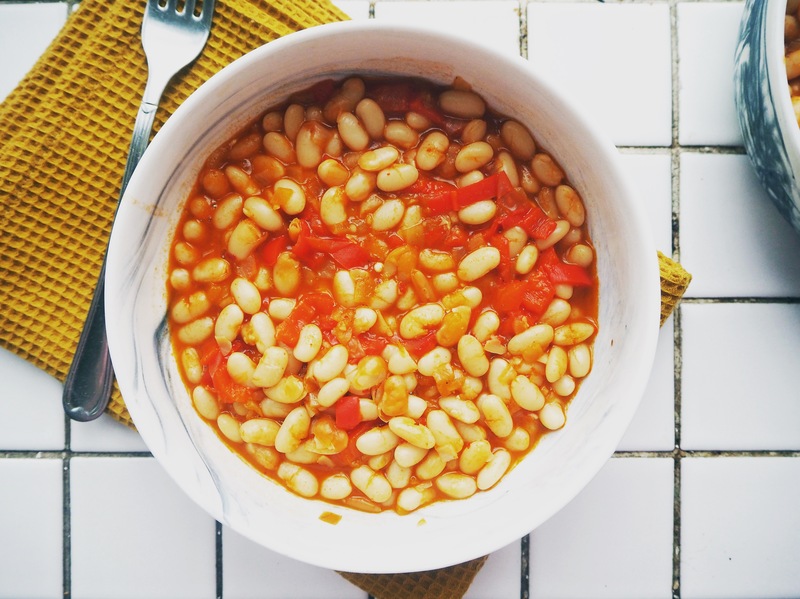 I’m a humble white bean lover, myself–will try this delicious-looking recipe! 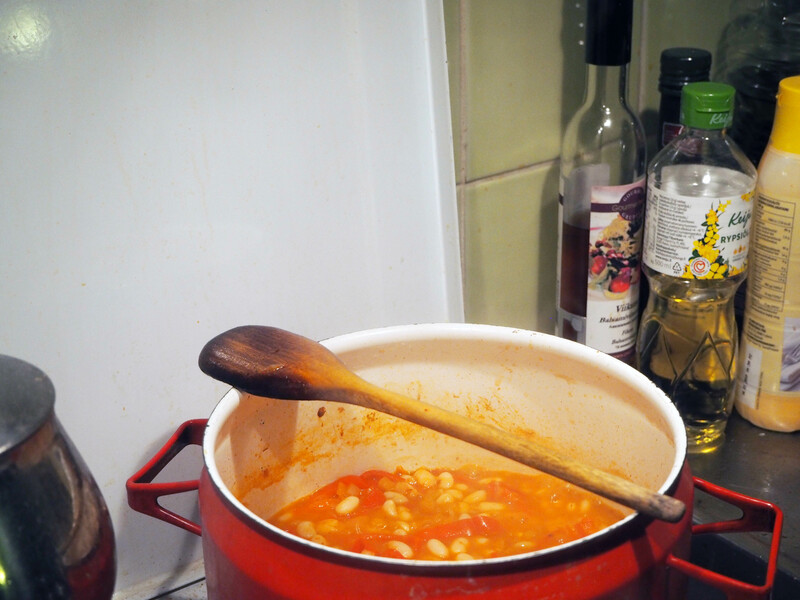 Love the red colour of final recipe. 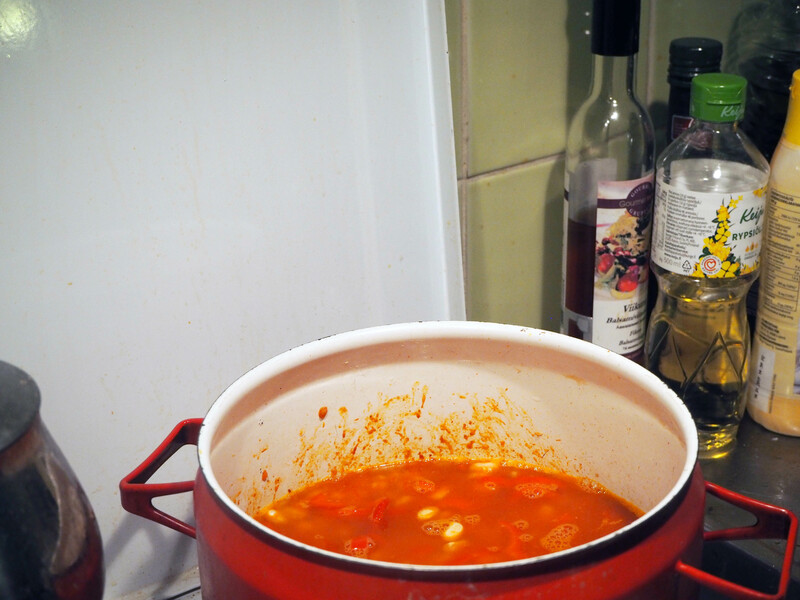 My Mom also made this hearty soup. Delish. 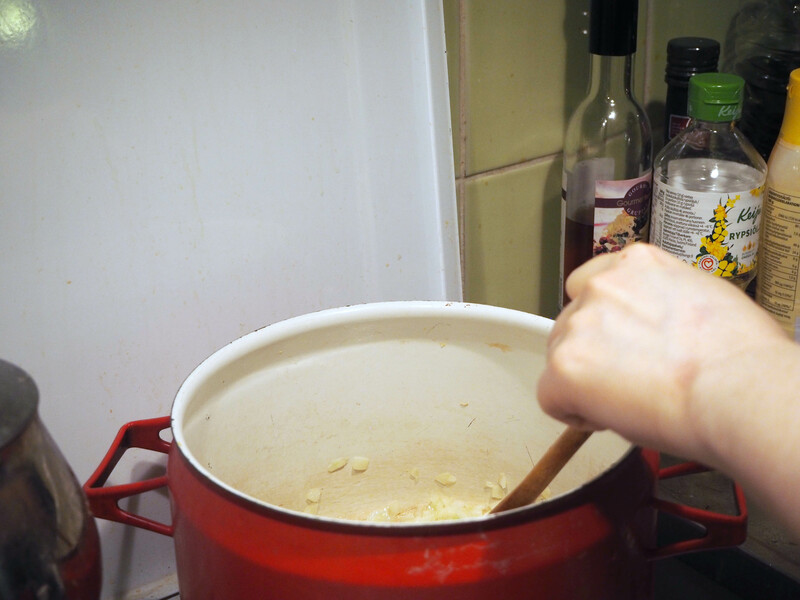 Oh yes, you can also perfectly make a soup version of it. Previous PostPhyllo Pie With Fennel, Mushroom, Rice, Leeks… And So Many More Things!